Jake Boxer, investigative journalist and host of the conspiratorial news show Bullseye, is in serious trouble. Not only is his soundman murdered by Russian intelligence agents while reporting on a secretive New World Order, but his network cancels his show, leaving Jake humiliated and spiraling into a deep dark depression. The Good Spy Dies Twice Captivates! 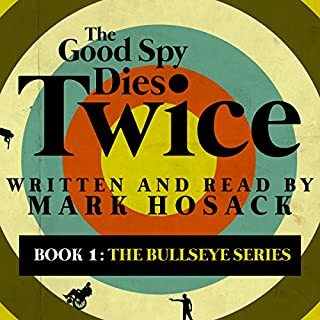 In Mark Hosack's audio version of his thriller The Good Spy Dies Twice, he reads with an animatedly alluring baritone of a voice that draws the listener into the story, oftentimes making the listener not want to take pause between chapters. Suspenseful music punctuates the book's opening sequences, lending the feel of a '40s style radio play. In 43 juicy, action-filled chapters, TGSDT is replete with action, sass, red herrings and at times, raunch that keeps the reader engaged in the plot's multitude of intricacies. I often found myself forwarding through chapters to find out what happens next in this chilling whodunit that takes place mainly in a ski resort town that houses a mysterious painting that is central to the novel. This tale of espionage and love recounts hero Jake Boxer's quest to decipher a cryptic text message from his newly betrothed wife. All this amidst a politically-themed backdrop involving a possibly murdered friend, Russians, drones and a mine. Hosack has a natural gift for writing and oral narration that is entertaining and packed with punch, both metaphorical and literal punch. For an all-around depthful and edge-of-your-seat piece of work, look no further than The Good Spy Dies Twice. Great for anyone who appreciates a good mystery thriller, listen to this book on long drives or to unwind at the end of your work day or work week for some suspenseful escapism. You won't regret it!